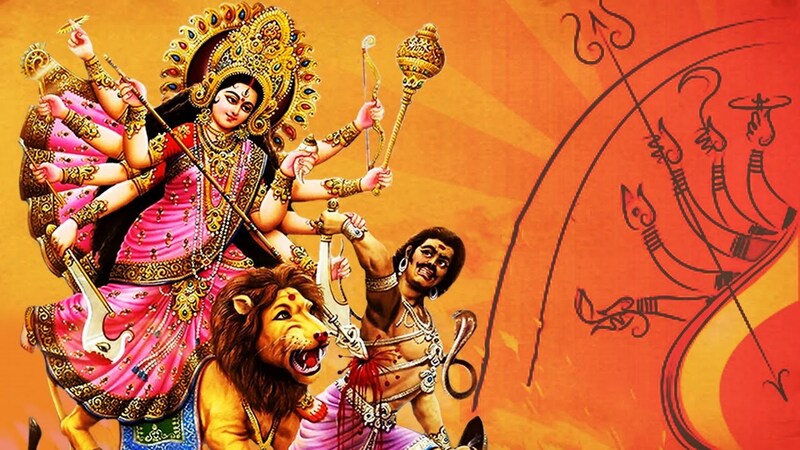 Mahishasura Mardini Stotram is most popular stotram of Goddess Durga, written by Guru Adi Shankaracharya. This devotional verse is addressed to Goddess, who killed Demon Mahishasura on the day of Vijayadashami. Mahisasura Mardini is the fierce form of Goddess Parvathi depicted with 10 arms who rides in a lion and carrying weapons and assumes symbolic hand gestures. Reading this stotra on Maha Navami, Dassehra, Diwali & Navaratri days is considered as very auspicious. Victory to You, Victory to You, (I take Refuge in Your Auspicious Feet) O the Destroyer of Demon Mahishasura; (Victory to You) Who Shine with Beautiful Locks of Hair and Who is the Daughter of the Mountain. Whose Battle expresses as Celestial Dance || 9 ||. That Lotus (Lotus Feet), Which is an Abode of Kamala (Goddess Mahalakshmi); (Therefore) Will He Not Himself Become an Abode of Kamala (i.e. filled with Purity and Prosperity)? Your Feet Indeed is the Supreme Feet (i.e. Supreme Refuge); Therefore, how can I Not Practise Devotion Towards them, O Auspicious Mother? Will He not Feel the Joy of Your All-Embracing Grace contained in Your Pitcher-Like Bosom (i.e. Cosmic Heart)? Otherwise, why have my Mind Turned Away from the Moon-Faced Beautiful Ladies like those present in Indra’s Castle?